Name Badges, Name Tags, Magnetic Fasteners, Pins, and Pocket Holders. Custom Printed and engraved. We offer a variety of options for plastic name badges. One option for name badges is to have engraved logos. If your logo is one color, this can be a less expensive option for including logo on your name badge. Brass Cawley Badges available in Gold and Silver in Large or Small size. 2+ Color Logos are either Foil Stamped, UV Printed or Screen Printed depending on how many colors, details of the logo ect. 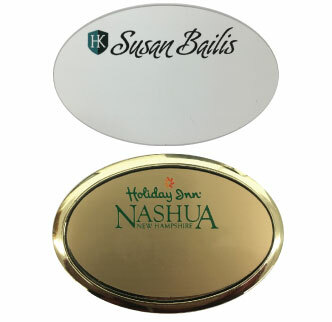 We can provide name badges in oval shapes as well. Pictured is a white badge with a 2 color logo, and below that a gold badge with a 2 color logo and gold frame. This is one of our best sellers, as the badges can be engraved or printed with a logo. The brass/silver plates come in two sizes 1" x 3" and 1.5" x 3". We also can print full color Identification Badges, Window Badges, Full Bleed Cards. Please contact us if you would like to speak to us about your next project. Magnets, Pins, Bull Dog Clips, Clip/Pin Combo. We have all the fasteners possible at the best prices possible. Window ID Card. Allows user to insert s disposable piece to easily change names as needed. Full Bleed Square badge. Eye Catching! Full Color Identification Card with lanyard punch. Can run 1000s of ID cards full color. Good product for establishments where security needs to be at a higher level.